Do you use an online CRM such as Salesforce or Zoho? Do you manage your address book online using Gmail or Outlook? 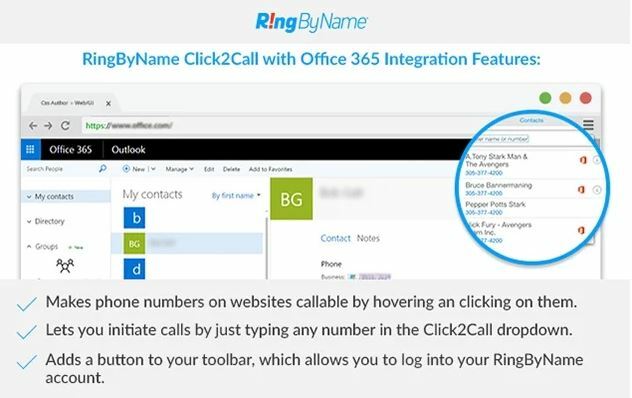 Did you know that RingByName's Click2Call Extension allows any telephone number that appears in your Chrome Browser to launch a telephone call on your phone system? This feature is supported by Salesforce, Zoho, Sugar CRM, QuickBooks, Google Chrome, and any other web based application. Not only does this eliminate the process of dialing altogether, but you can make the call with just a click of your mouse! If you have not already installed it on your Google Chrome Browser, click here to visit the Chrome Store to install it. Hover over any number and then simply click the R! link once it appears on top of the number. You may need to "Enable: Auto-Detect" to get the R! Link to appear over a phone number. To enable, click on the R! icon in the top right corner, then click on "Settings" and toggle the button to turn on "Enable: Auto-Detect"
Using the Google Chrome extension, users of Office 365 can access their secure contact lists from within the web browser to launch a phone call and or to provide additional information about their contacts within RingByName’s expanded Caller ID pop-up. This allows Office 365 users to enjoy the benefits of the Click-to-Call interface without synchronizing large corporate contact lists.